I have been reading Dorcas Smucker’s blog, Life in the Shoe, and her Register Guard column, Letters from Harrisburg, for several years now. 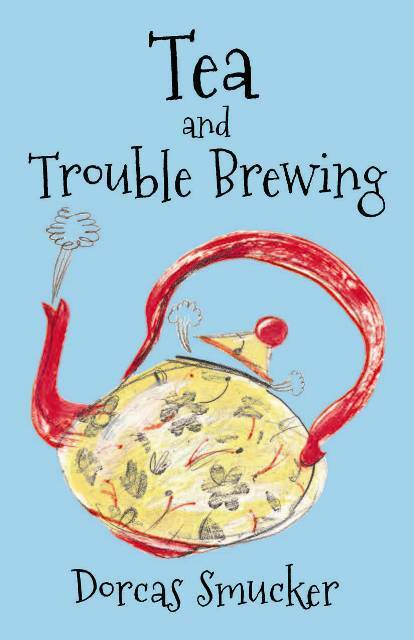 When she posted a request for help in reviewing her latest book, Tea and Trouble Brewing, I jumped at the chance. Unfortunately, once I was committed, I remembered that I have never reviewed a book on my blog. I started to feel a little intimidated. I was worried that I wouldn’t do her words justice. Fortunately, as I neared the end of this delightful book, I read the essay “Climbing My Mountain”, and felt encouraged to write my first book review. Tea and Trouble Brewing is a compilation of 34 of Dorcas’ newspaper articles. I had already read the majority of these articles when they were originally published by the Register Guard, but it was a pleasure to read them again, one right after the other. Reading this book was like sitting on the porch and chatting with a good and wise friend. Dorcas writes of the every day. Life with six children. Life in an old farmhouse. Experiences that many moms and wives share. Kitchens, pets, children, anniversaries. These stories are told with humor and wisdom, and also with honesty and grace. That she is still trying to get it right, doesn’t always get it right, and it is ok if she doesn’t. She is trying. And she encourages us to do the same. In “The Children Who Leave or Stay”, Dorcas discusses the differences between being the child who lives near the parents and being the one who has moved away. Her words resonate with me as I am “the one that has chosen to stay”. In “An Old Tree, an Old Dog”, Dorcas writes of the loss of their great old oak tree and one of the family pets, both occurring within the space of two weeks. Who hasn’t experienced the heartbreaking loss of a family pet? On the surface, Tea and Trouble Brewing felt like a lighthearted read. There are many humorous stories throughout the book that had me giggling. As I read more, however, I found Dorcas’ wisdom and voice moving around in my mind, settling there and encouraging me on my own journey as wife, mother, daughter, sister and friend. Dorcas has graciously sent a signed copy of her book for me to give to one of my readers. If you would like to enter this giveaway, please leave a comment on this post between now and Sunday, November 25. You can also purchase from Amazon with a credit card. Dorcas has three other books that can be purchased on either site…Ordinary Days, Upstairs the Peasants are Revolting, and Downstairs the Queen is Knitting.